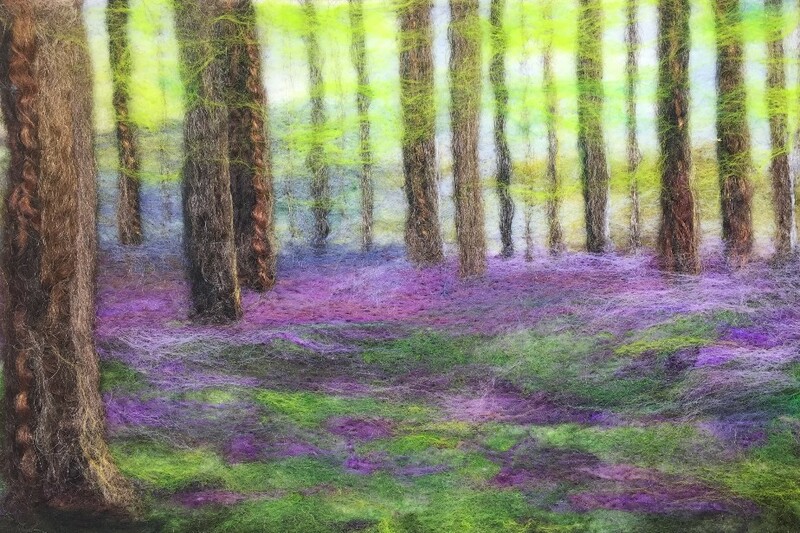 Bluebell Woods are one of my favourite subjects to felt. It's a relatively simple image but the possibilities for colours, textures and methods are endless and every piece turns out different. When I am in the mood to experiment with methods, textures, new fibres and new needles this is the perfect subject to come back to. 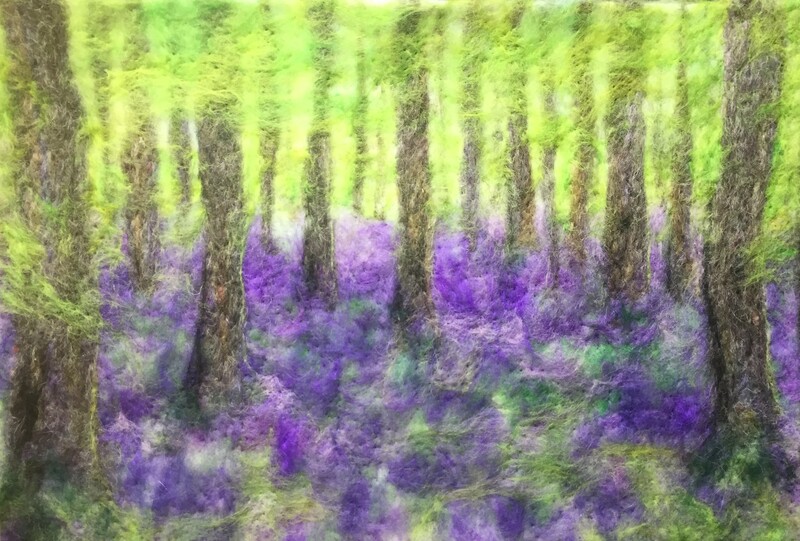 Bluebell Woods 1 at needle felted stage. 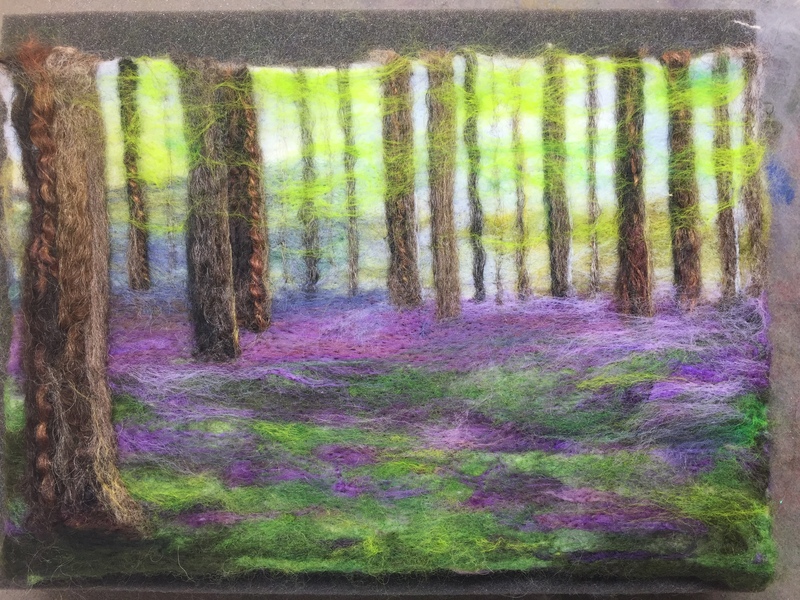 The first bluebell wood piece started life as a needle felted piece (shown above). At this point I only possessed a handful of basic needles and merino wool so variation in texture is minimal and there is more focus on varying light and colour in the image. My intention was to wet felt this piece so I have used the needles just to hold the fibres in place on the backing felt. Felting needles are barbed so they work by catching the fibres and pushing them into the backing. There are lots of types of needles that do different thing but that a subject for a whole separate blog post! The next stage was to pop the piece on to some bubble wrap on a towel (lots of towels, always lots of towels). I then filled a spray bottle with warm, soapy water and sprayed the whole this until soaking. Next step, roll it tight and roll as many times as you have patience for. The more its rolled the tighter the fibre cling together so dependant on the effect you want too. 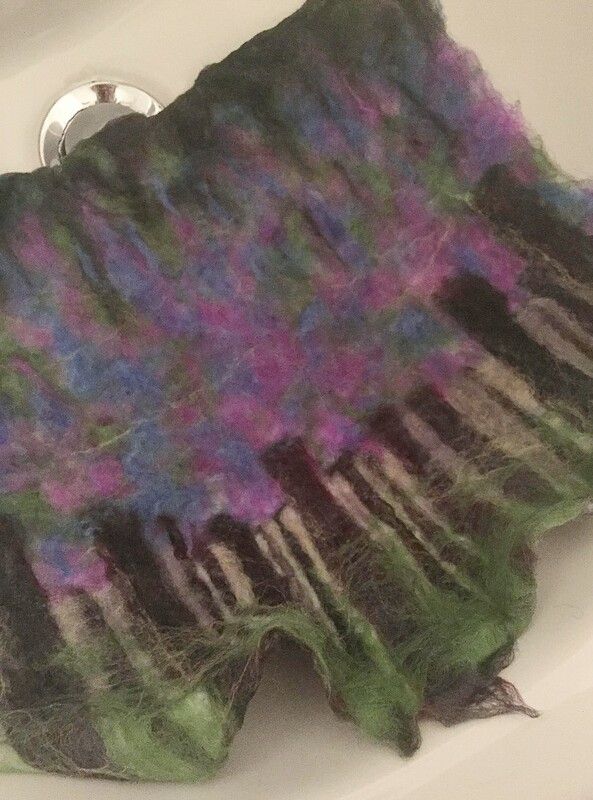 Wet felting is much more unpredictable than needle felting so I find it more suitable for more abstract pieces rather than specific landscapes where accuracy is more important. The accuracy of wet felting can be improved with tighter needle felting first and also depends on the type of wool used. 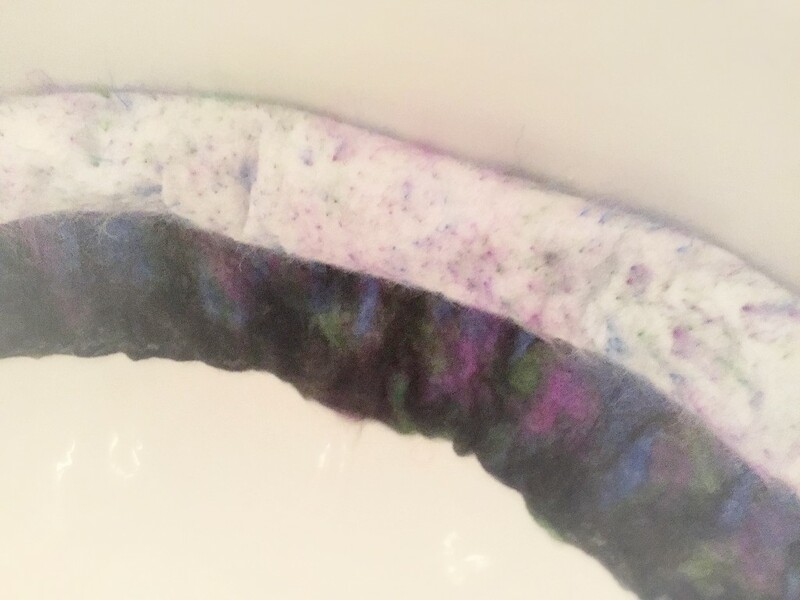 There are lots of ways to wet felt wool. I sometimes use a bamboo rolling mat or a textured rolling pin. Throwing the piece after rolling also helps tighten it up - my son loves helping with this bit! This is me just lightly rubbing it with soapy bubble wrap to smooth out the surface fibres. Then it's to the sink for a rinse in cold water to get the soap out. A few more roll up and squeezes and a handful of throws into the sink. Rolling and squeezing the felt piece before throwing. Amazing how sturdy it is at this stage. 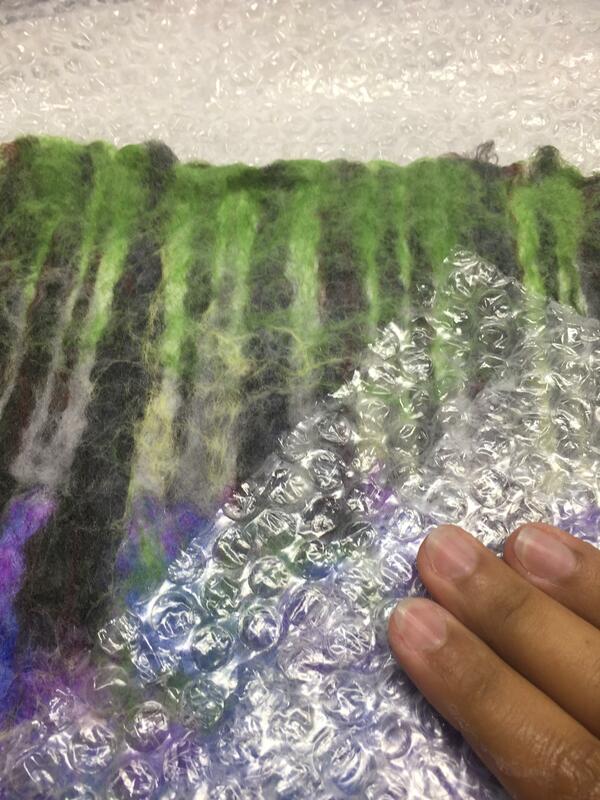 Opening up the piece after wet felting is both exciting and scary! A lots of time and effort comes down to this moment and the effect achieved is very unpredictable. It's not always necessary to wet felt the piece. It can help strengthen and flatten the surface of the piece so it can look 'tidier' and is especially useful if a piece isn't going to be framed. 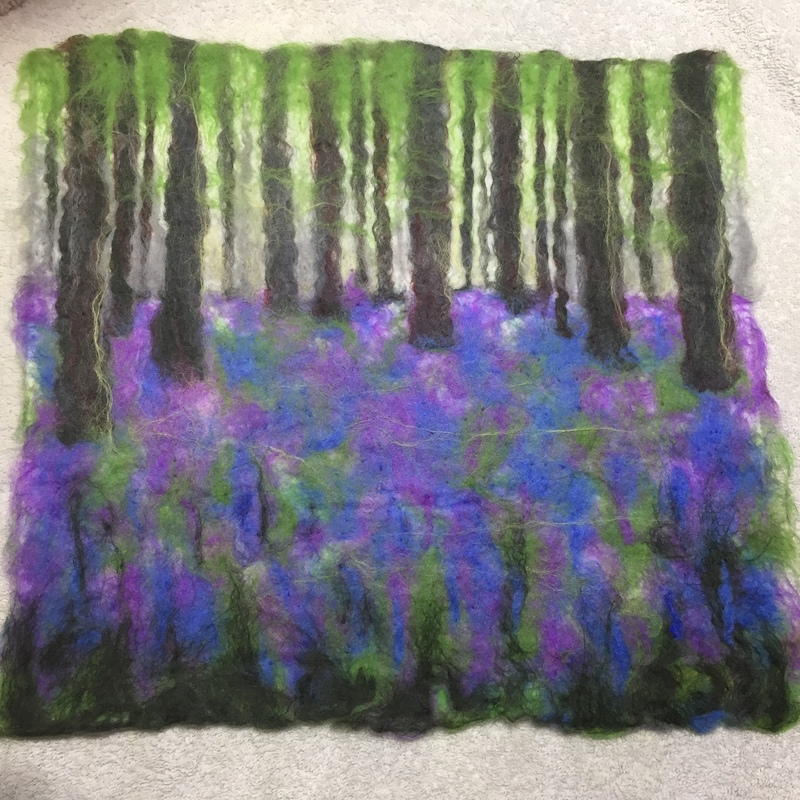 Nowadays I use it more for making bookmarks, bags and scarves than for the pictures as needle felting gives me more control. This one aimed to be brighter, cheery and full of light. This gorgeous luminous green came in a mixed pack of merino and has been used in so much of my work to add little glows of light. Magic stuff. This one was going for more structured composition - I was probably having an 'everything must be straight' day. 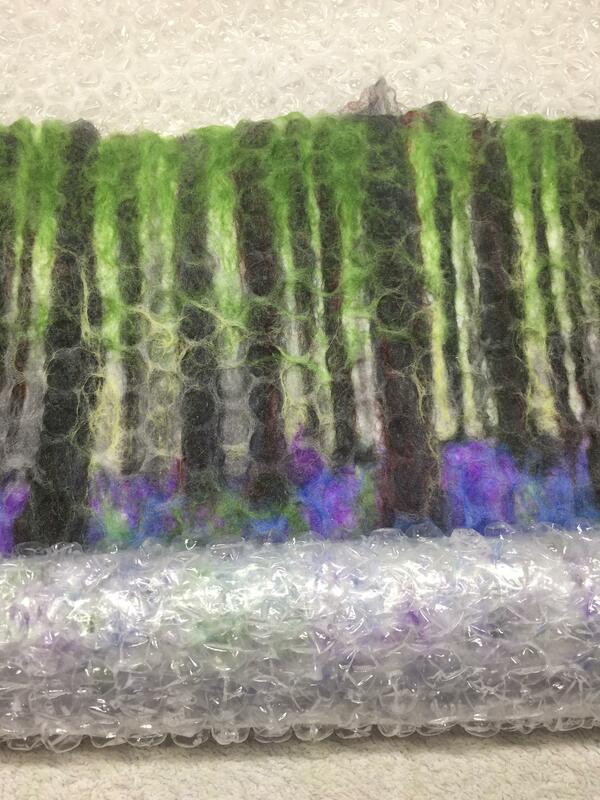 I've used a silver needle to defined the edges of the trees and give then a 3D effect. A silver needle has more barbs. When used along a line it felts the fibres tightly along the line and holds them closer to the backing - a little bit like a stitch line if you're a sewer/embroiderer. I sometimes use it to define horizon lines as well. 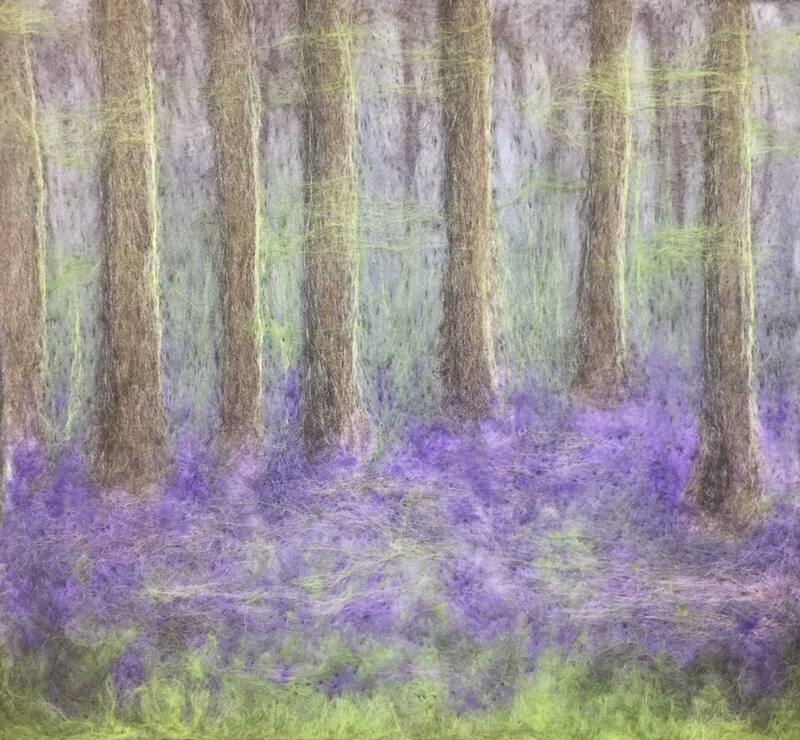 I made Bluebell Wood 1 in October 2016 and Bluebell Wood 4 was done in October 2017. I've learnt about and acquired a few more needle and fibre types in the space of the year so have been able to use these to experiments with textures and depth and put so much more into this seemingly simple scene. 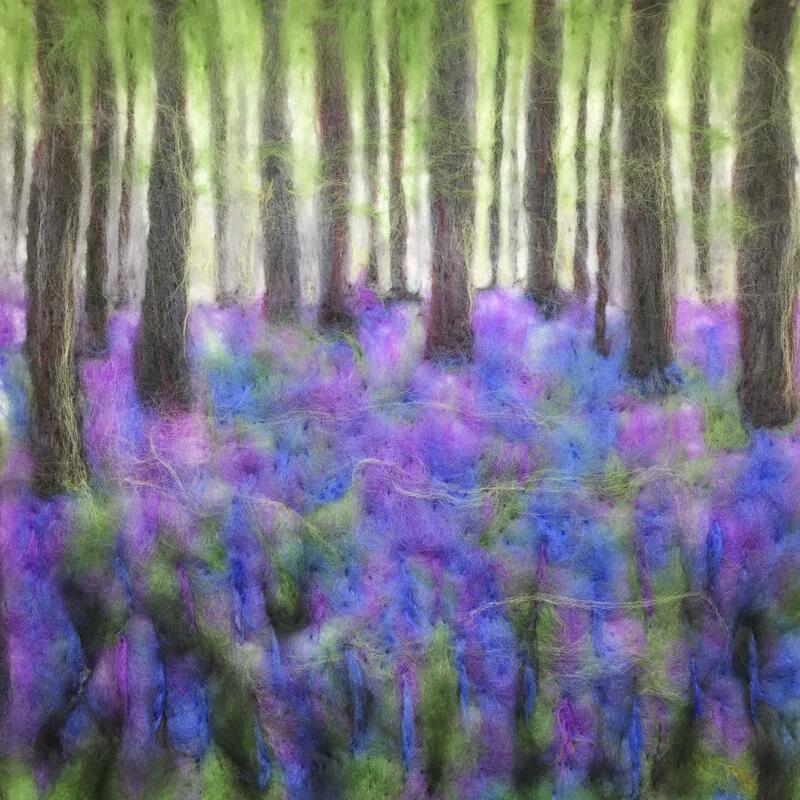 All four bluebell wood pieces use the same source photo - another example of how the source photo doesn't always play a huge part in the finished piece as much as mood and colours/textures available!